Begin with Opening A (fig. 2A). 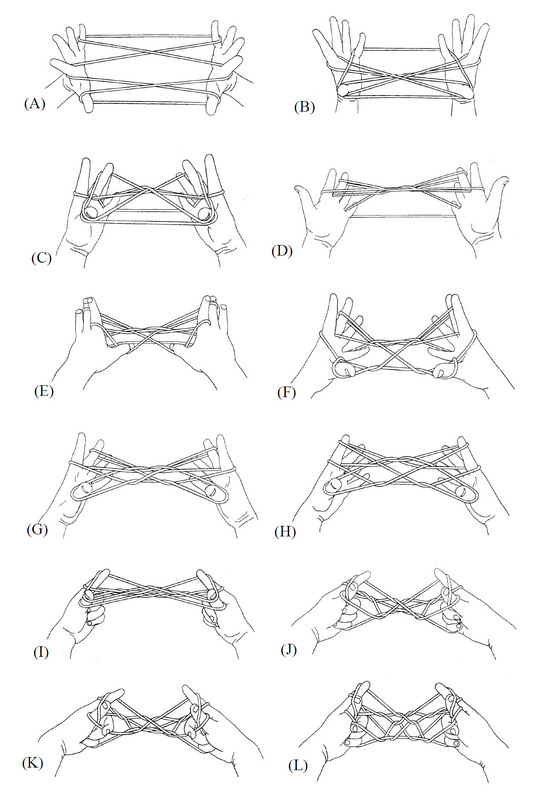 Pass each thumb away from you over the near index string and over thefar index string, then pick up the near little finger string and return (fig.2B). Pass each middle finger toward you over both index strings and down through the upper thumb loop (dip into the well), then pick up the lower far thumb string and return (fig. 2C). Drop both thumb loops and extend (fig. 2D). 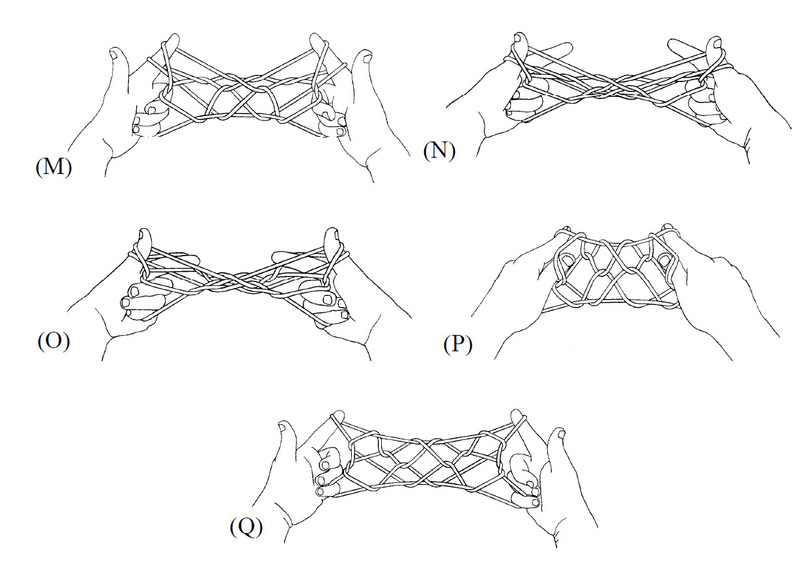 Pass each thumb away from you over the near index string and under all other strings (fig. 2E), then pick up the far little finger string and return (fig 2F). Share the upper index loop with the thumb (i.e., with each thumb pick up the upper near index string and return). Close the middle, ring, and little fingers to the palm in preparation for the next move (fig. 2I). Pass each middle, ring, and little finger (the “three lesser fingers”) under both index loops and insert them, from below into both thumb loops; close the upper near thumb string to the palm, drawing it down through the lower thumb loop (fig. 2J). Extend the middle finger, pass it toward you under the index loops, and insert it, from below, into the lower thumb loop; curl the middle finger around the lower near thumb string (fig. 2K) and draw it away from you, through the ring-little finger loop, and close the middle finger to the palm; drop the ring-little finger loop and insert these two fingers into the middle finger loop, closing the far middle finger string to the palm (fig.2L). Drop both thumb loops and extend. (fig. 2M). Transfer both index loops to the thumb, maintaining their relative order (fig. 2N). With each index pick up the lower far thumb string (fig. 2O), then curl the tip of each index around the upper far thumb string, drawing this string down through the index loop, which slips off as you rotate the index away from you and up (fig. 2P, i call this “curling out the transverse string”).